The main question most artists are asked is “What is your vision?” Artists are expected to come up with some lofty description of a complicated concept spoken in a manner intended to deliberately confuse, hopefully with a snobby accent. The more confusing the description means the greater the artist’s vision must be. Some artists agonize over an artist’s statement hoping for just the right definition of the perfect artistic vision. But do artists set out to develop a vision that fits within some high- minded description? Or do they simply take what’s inside and bring it outside for others to see. Alain Briot, writing for Luminous-Landscape states of artistic vision, “It is something you see in your mind’s eye.” Artists can’t always verbalize what is in their “mind’s eye.” That’s why they paint. Articulating what is inside through painting, is how artists communicate. If they could verbalize this vision, they would be writers. Some artists are both writer and painter. Even then, it can still be difficult to verbalize what is an inner feeling or motivation that can only be expressed in paint. Whistler solved this issue by naming his paintings with musical terminology. 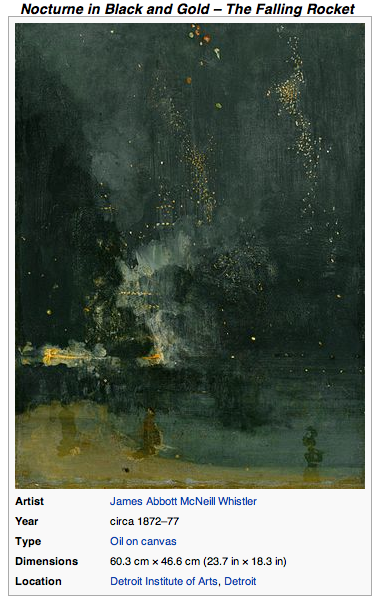 The painting shown is titled, Nocturne in Black and Gold—The Falling Rocket. Perhaps Whistler’s musical title was meant to inform the viewer of the painting as a dreamy night vision. The title directs the viewer with more intrigue than a simple title of The Falling Rocket. As a nocturne, the viewer associates music with the painting. Now the rocket is dancing rather than simply falling. The painting has more drama in the mind of the viewer. Artists are paid for the vision over the labor. How that vision is or is not articulated can make the difference. People often don’t read a long artist’s statement. They will, however, read the title of a painting. So much more vision can be expressed through a title than through a statement. Concentrating on visionary titles over visionary statements may be a much more effective expression of artistic energy. And it will likely reach more people. Here is Mr. Bean as an art historian describing Whistler’s vision in his most famous painting, Arrangement in Grey and Black—The Artist’s Mother more commonly known as Whistler’s Mother. I doubt this is what Whistler had in mind but you never know!